Roswell Bookbinding, Phoenix, AZ, has added a new Kluge EHG Foil Stamping, Embossing, and Die Cutting Press. Building on Kluge’s long history of quality, durability, and strength; the EHG is a popular choice for Kluge users that want to upgrade to a larger size press with the added convenience, time and cost savings of an electronic foil control system and the adjustable impression feature. 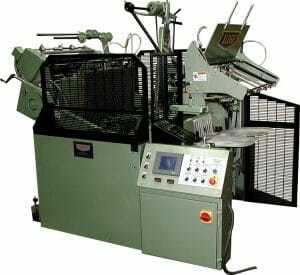 Made in the USA and designed to accommodate an image area of up to 22×30” at speeds of 1700 iph, the EHG Series Half-Sheet Press is suitable for stock ranging from onion skin to paperboard. Delivering an impressive new capacity to Roswell’s capability. Founded in 1960 by Mark and Iris Roswell with the original focus on Library Binding, Roswell Bookbinding added Edition Binding in the late 1960’s and the family-owned business has grown steadily over the past 56 years. Today Roswell is proud to offer a large variety of skillfully-crafted bookbinding solutions. “The KLUGE EHG, with its oversize capabilities, enhances Roswell’s reputation of being the primary source for producing high-quality, large format and oversized books on a coast-to-coast basis” says Michael Roswell, President Roswell Bookbinding.